i got i bill from Salt of of 300fr, my abonament its Plus Europe 99fr per month and incluis calls to abroad. 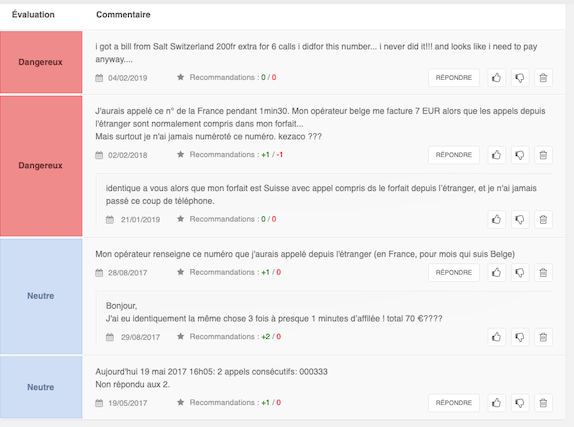 this month i got extra 205fr for calling 6 times in space of 40 min to +33 333000 4 phone calls of 1-2 min and 2 calls of 14min. 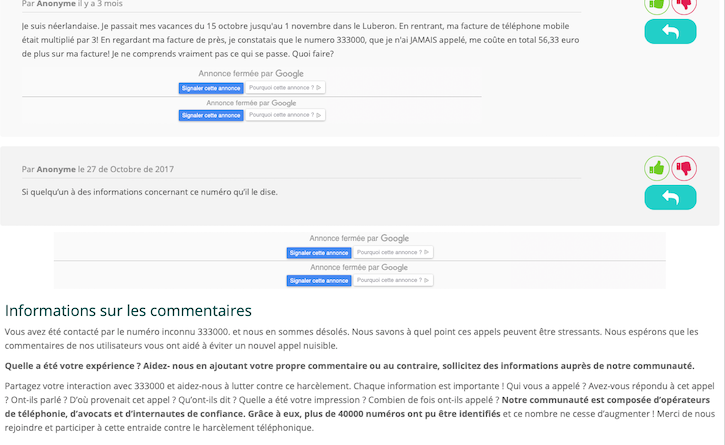 i never made this calls, i call to salt and they said the number looks stange because they cant see from witch person or company it is but thay cant do nothing and i need to pay..... i search on internet and i found some others persons add problems with this number, in netherland and belgium. was somebody else here scam with this number? I'm sorry, but I can't follow what your issue is. Deepl.com have a pretty good Portugese to English online translator. i got i bill from Salt of of 300fr, my abonament its Plus Europe 99fr per month and incluis calls to abroad. Were you on the Salt network at the time of the calls or were you abroad and you received calls and have been charged for incoming calls whilst roaming? Were you in a border region and your mobile strayed onto the French network? From what I remember from my Salt bills when I still was with that company (for good reasons changed that!) the bill always came with full details. Can you check the time of the calls? Any chance you might have catched a malicious app doing those calls? Anything that MIGHT mean they actually happened from your phone (unwarranted, of course)? Are you anywhere near the border, so it might have been roaming charges? The bill should be clear enough of all of that (maybe post a screenshot of the details that are interesting for us to analyse?) 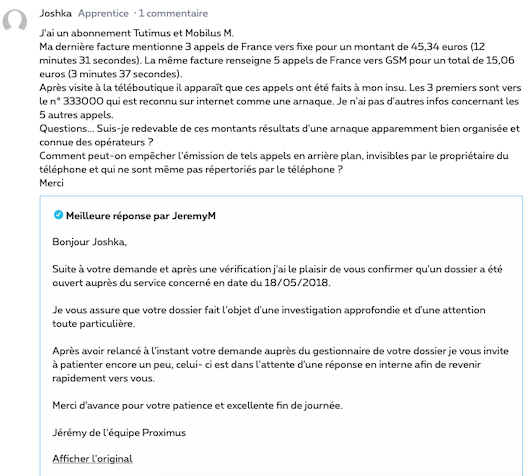 Maybe that +33 number (which is France) isn't a regular number, but an (expensive) hotline you tried to call? So presumably the charges are for incoming calls which you received (picked up) whilst on the French network. Those calls are not included in your plan. In this case the invoice is correct. The caller's number is not always listed on the itemised bill in these instances, hence the 'general' number +33 333.. etc you cited. To avoid such charges you need to put the network search onto 'manual', so that the phone can't 'roam' onto foreign networks. This is vital in border regions if you do not want to be charged. Whether you can then be reached is another matter. 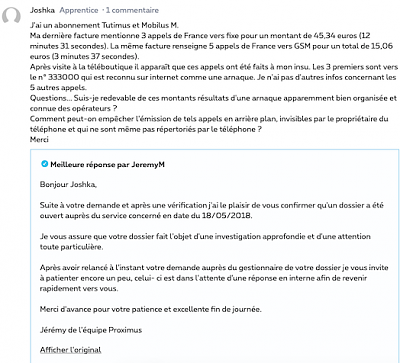 The invoice states calls whilst abroad, so you were indeed on the French network and as such these calls (whether made or received) are not included in your plan, hence the charges. The French operator has not provided Salt with the exact number you dialled or your phone has dialled a premium rate service. I would email Salt and ask for an explanation of exactly what the calls are. They must reply to your written request. 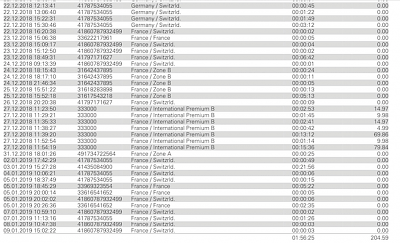 Did you make or receive any calls at those times (regardless of the number cited on the invoice)? Yes I saw similar comments on websites about this number. Email all of that to Salt and only pay the part of the invoice that you agree with/that you find genuine. Tell them you are only paying for the rest of the invoice and not for the suspect calls. If you are certain you did not utilise any premium rate service at the specified times and/or did not request/activate any service then you should not have to pay. 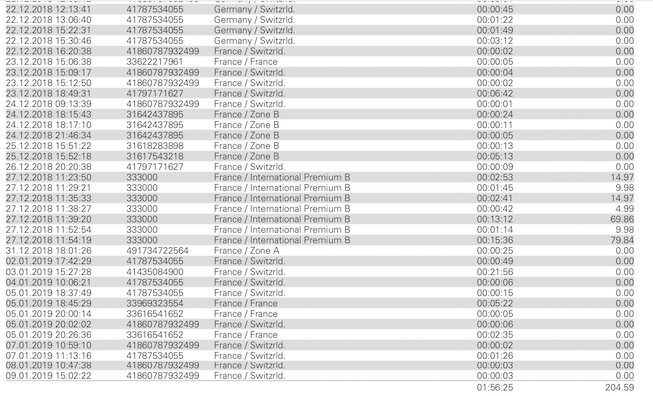 i have inclued in my plan free calls to Europe and in Europe to other numbers, if you see in the bill others calls are made in france and the cost its 0 . just this ones are charged i mean high charged! Sorry. I didn't realise you also had some roaming included. The reason that these calls have been charged though is that it is not a standard (mobile or residential) number, but a premium rate service with a special (higher) charge rate - hence them not being included in your plan. As mentioned: send an email to Salt and only pay the part of the invoice that you agree with/that you find genuine. Tell them you are only paying for the rest of the invoice and not for the suspect calls. If you make partial payment you certainly will not be blocked immediately. There is time to resolve this. Make sure all of your previous invoices with them are paid in full. Another option is to pop into a Salt shop. Preferably go with someone who is fluent in either French or German if you are not. The Salt hotline will typically try to get rid of you to avoid the hassle and cost of the case and of refunding you, so over the phone it is unlikely you can resolve this. Celebrate only after the invoice is corrected/annulled.